"My daughter Laura and I, as well as the Shuster estate, have done nothing more than exercise our rights under the Copyright Act. Yet, your company has chosen to sue us and our long-time attorney for protecting our rights." Nikki Finke has published a letter from the late Joanne Siegel to Jeffrey Bewkes, Chairman and CEO of Time Warner, Inc. The Siegel estate has been fighting to recapture their share of the copyright to Superman. Under U.S.copyright law, works sold to companies can be recovered by the creators at specified periods. There is no question that Superman was not a work for hire. Jerry Siegel and Joe Shuster created it independently and tried selling it for years before it was bought by what was to become DC comics, now owned by Time Warner. I've spent a fair amount of time on this blog warning creators about losing their rights. Anyone who has an idea that they hope to bring to the public needs to read this letter. Paste a copy of it wherever you do your creative work to remind you that it's possible to create a billion dollar property and still have to fight for what's legally yours. "To protest harassment of us that will gain you nothing but bad blood and a continued fight. "To protest harassment of our attorney by falsely accusing him of improper conduct in an attempt to deprive us of legal counsel. "To make you aware that in reality this is a business matter and that continuing with litigation for many more years will only benefit your attorneys. "This is not just another case. The public and press are interested in Superman and us and are aware of our and your litigations. "The solution to saving time, trouble, and expense is a change of viewpoint. Laura and I are legally owed our share of Superman profits since 1999. By paying the owed bill in full, as you pay other business bills, it would be handled as a business matter, instead of a lawsuit going into its 5th year." I haven't bought much original artwork in recent years, but I couldn't resist this drawing that I purchased on eBay recently. It's from the film We Have Met the Enemy and He is Us, made by Walt and Selby Kelly. Walt Kelly, creator of the Pogo comic strip, was reportedly unhappy with the TV special made of the strip, The Pogo Special Birthday Special, which was directed by Chuck Jones. 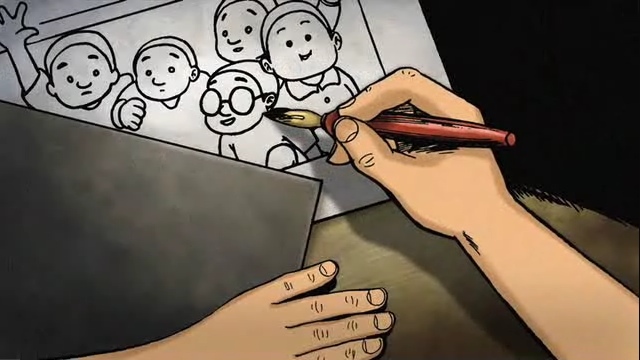 Following that, Kelly and his wife Selby decided to make an animated film on their own. Both of them had worked at Disney on the pre-war features and Selby had continued to work in animation after Walt left it to work in comic books and strips. The film was to be a half hour, but it ended up being only 15 minutes or so. It also suffered from poor distribution, never playing TV and rarely screening anywhere. VHS copies were for sale several years ago, though I have no idea if that offer is still good. 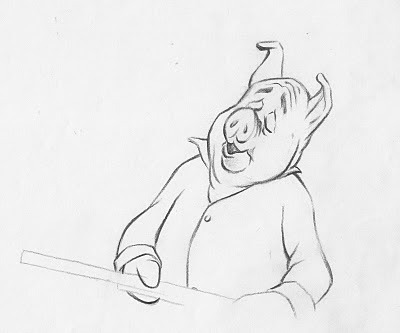 The drawing above is of the pig villain in Kelly's film, a polluter who is happy to point out that he is no more guilty than those who think of themselves as innocent. Kelly's environmental view was that we were all responsible, not just the large companies who were known to pollute. The drawing above is typical of Kelly's work in many ways. It is dimensional and Kelly's line varies its thickness to sculpt the forms of the character. The face is expressive; Kelly was a master of the pose that communicates. I'm looking forward to having this drawing framed. 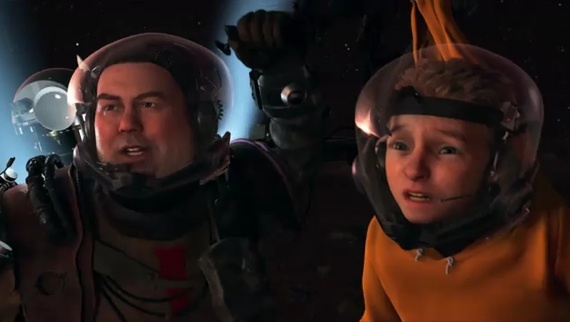 “Mars Needs Moms” may lead to the end for the Zemeckis style of motion-capture filmmaking, which has proven increasingly unpopular with audiences. Unlike the digital animation used by Pixar, in which movies are created entirely by computer, the Zemeckis technique requires actors to perform on bare sets while wearing uniforms outfitted with sensors to record their movements. Those movements are then transferred into a digital model that computer animators use to create a movie. Critics and audiences alike, with audiences voicing their opinions on Twitter, blogs and other social media, complained that the Zemeckis technique can result in character facial expressions that look unnatural. Another common criticism is that Mr. Zemeckis focuses so much on technological wizardry that he neglects storytelling. The trailer for the animated feature based on the work of manga artist Yoshihiro Tatsumi can be seen here. Two comics, two creators, two different outcomes. A couple of things popped up this week which show, by contrast, the benefits of ownership. Jeff Smith is a former animator who is the creator of Bone and RASL. 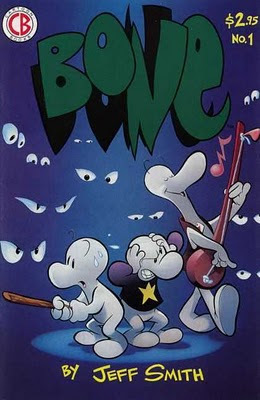 Bone began in the '90s as a self-published comic book distributed to comics shops. Since then, Smith has collected the comics in a series of graphic novels and a one volume edition. Scholastic Books reprinted the series in colour and later this year, there will be a one volume colour edition. Smith had a movie deal with Nickelodeon for Bone, but Nickelodeon dragged things out Smith and Nickelodeon parted company. Later, Smith made a deal for Bone with Warner Bros. The experience with Nickelodeon made Smith more demanding, and Warner Bros. agreed to his terms. Now, Smith's latest comics series RASL has also been sold to Hollywood. The week, the depositions in the copyright termination case brought by the Jack Kirby estate against Marvel were made public. The case turns on whether Kirby's work was at the direction of the company or if Kirby was a creator who sold his work to Marvel. The waters are muddy as the legal arrangements in the comic book business in the 1960s were shockingly casual. Regardless of the legal decision and one's own opinion, Kirby is definitely the designer of The Fantastic Four, The Hulk, Thor, Ant Man, Nick Fury, The X-Men, and the many villains and supporting characters who filled the stories that he drew for these characters. Kirby was way more prolific than Jeff Smith in terms of the number of his creations and the number of pages he drew. Yet Smith is a millionaire and Kirby never received a nickel beyond what he was paid for each individual page. Because Smith owns Bone, he has been able to repackage it and profit from it each time. He's been able to merchandise it and license it to other media. He will be able to do the same with RASL and will be an executive producer of the film. Kirby owned nothing of what he created at Marvel, unless the termination of copyright suit determines otherwise. 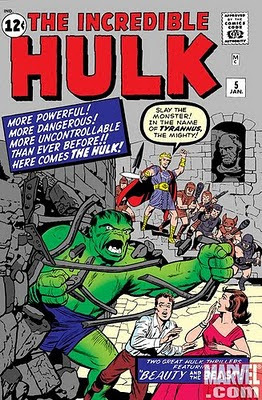 Just using the Hulk as an example, the work has been reprinted countless times, been an animated TV series, a live action TV series, two feature films and countless toys, posters, etc. Kirby was not compensated for any of this. As much as we love animation, it is a team sport. It takes a lot of people and a lot of money to make a film. That leaves animation creators pitching their ideas to corporations in order to get their ideas funded, and the corporations routinely take ownership. A first-time creator has no leverage to gain a percentage of the profits, merchandising or to reserve certain rights. In this regard, animation creators resemble Jack Kirby more than they resemble Jeff Smith. However, if you can establish ownership of your property and demonstrate that it has an audience, you can continue to control and to profit from your work. That probably means working in a medium other than animation to start with, but given Hollywood's current mindset about sequels and pre-sold properties, it's probably more likely you'll get an animated film made by creating something outside animation than inside it. Jeff Smith could take advantage of different economic circumstances in the comic book field in the '90s than Jack Kirby had in the 1960s. And with all due respect to Kirby, Smith has a better head for business than Kirby ever had. That's the point. 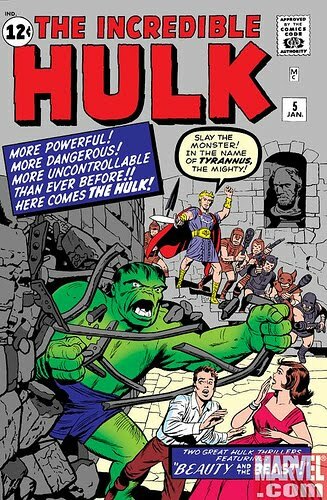 I'd be hard pressed to name anyone who worked in popular culture in the 20th century who was more fertile or prolific than Jack Kirby. Smith, by comparison, is a lightweight. But because Smith maintained ownership of his work, he maintained more control of it and made more money from it than Jack Kirby. That's the benefit of ownership. As a 90th birthday gift, Børge Ring's children have created a website for him. You can watch his independent films there and leave him a message. Eventually, the site will include links to articles about Børge and information about his musical career. The Winnipeg Free Press is reporting that Starz Animation has been sold to a group of investors headed by marketing executive J. Thomas Murray and executive producer Steven B. Hecht. Starz LLC, the current owners, will continue to own a minority stake. Starz latest project is Gnomeo and Juliet, which has grossed more than $74 million and is still showing in theatres. The studio was founded by Dan Krech and was known for years as DKP. It was sold to American telecom company IDT, which made the cgi feature Everyone's Hero in the facility. IDT abandoned the animation business and sold the studio to Starz LLC. The Toronto studio is also responsible for the feature length version of Shane Acker's 9.